My brother, Martin Doering, is a 28-year-old man in need of a lifesaving kidney transplant. A few months ago Martin was diagnosed with end stage kidney failure and is currently on dialysis three times a week. There is suspicion that the cause for both of his kidney’s to fail is a disease called IGA Nephropathy, a disease he acquired genetically and for which there is no known cure. There were signs of this illness in his childhood but he was never properly diagnosed. In severe cases, this illness can fester undetected until it causes end stage kidney failure 20 years after symptoms have first occurred, and unfortunately that is what seems to have happened to Martin. Until a living kidney donor can be found, he is on dialysis treatment 3 times a week for 4 hours. Martin went to Indian Hills High School in Oakland, NJ and earned a Bachelor in Wood Technology from Pitts State University in Kansas. He currently lives in North Arlington, NJ and works as a Project Engineer. Martin is a hardworking, talented young man with much left to contribute to the world. We hope to soon find a suitable kidney donor so that he can continue on his path. Martin is lucky to have medical insurance, but it does not cover all expenses; the uninsurable medical bills are already piling up and will likely continue to do so for the rest of his life. We are hoping to take away at least one of his many burdens in this difficult time and raise a substantial amount of money to cover any uninsurable bills, costs for transportation to and from the transplant center for both Martin and a living donor, anti-rejection medication post-transplant, and a long list of many other unavoidable and costly expenses. To help offset such expenses, a fundraising campaign in Martins’s honor has been established with Help Hope Live, a trusted nonprofit organization that has been providing community-based fundraising guidance to patients and their families for more than 30 years. All donations are tax-deductible to the full extent allowed by law, are held by Help Hope Live in the MId-Atlantic Kidney Transplant Fund, and are administered by Help Hope Live for transplant-related expenses only. If you would like to make a contribution, please click the DONATE NOW bar. If you donate from outside the U.S. through the DONATE NOW Button, you need to select “Canada” or “Outside the US” at the bottom of the “State menu”. Your support is critical to the overall success of Martin’s Journey. Any and all contributions count. Thank you in advance for your kind consideration. 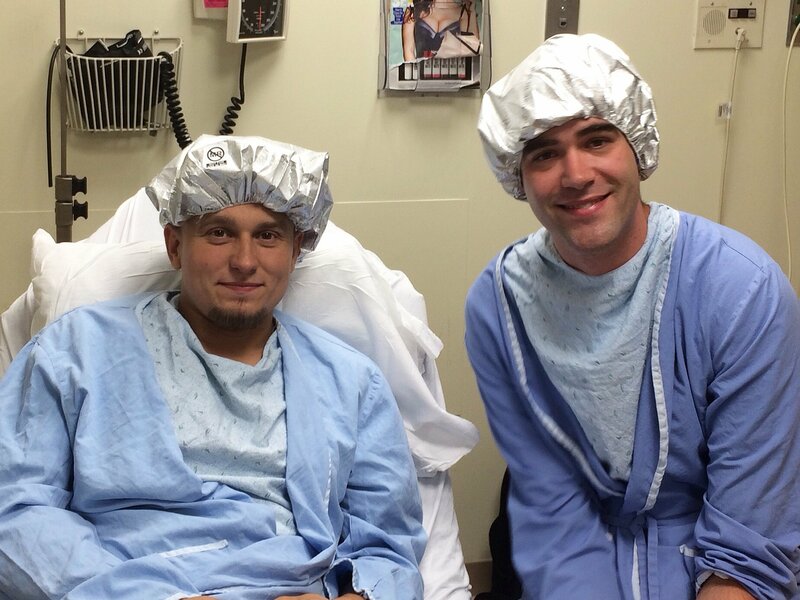 Martin and Scott both made it through the surgery successfully. The doctors said Scott donated a very nice kidney. And it is already working!!! We are incredibly relieved and thankful. We know the next couple of weeks are going to be rough especially for Martin but now it is all about healing. We continue to appreciate your donations, as the biggest bills are yet to come we really appreciate the help! Thank you. Martin has one more dialysis treatment before the surgery. In the photo he and Scott are hanging out after a day of final tests. Scott is going to donate his left kidney for Martin. The kidney transplant surgery is scheduled for Wednesday September 28th in the morning. Excellent news! Martin’s brother-in-law Scott is a 5/6 match and he is traveling to NJ from Nova Scotia, Canada so that he can donate one of his kidneys to Martin on Wednesday, September 28th. We appreciate all the amazing support we have received from so many, the next week will be a challenge for Martin and Scott please wish them luck! Merry Christmas, Martin! Glad to hear you made it through the surgery! Martin, To you and your brother in law. I'm so happy that everything went so well. Time will make and continue to make things better. Your a Gods gift to your friends, family and all of us. Wishing you all best in your continued recovery. Keep up your strength, keep your mind strong! And give thanks to the Big Guy! And of course the Big Guys special hands he works through making the surgery capable and successful! Best wishes Martin and Scott in your recoveries! Sending lots of love and support!! More Tribute donations *hug* Best wishes. Hoping you reach your target and get back to full health. Here's a donation from Tribute in Eve and a guy in the UK. Sending you all of our love. Martin you're such an important friend to this family. We wish you the speediest recovery. Good luck and best wishes from New Eden, hopefully I can steer a few bucks your way later in the week. Hey Martin, You have always been here for us even though we live what seems like a world away. It's time for us to be there for you. You are always in our thoughts, we will fight this with you. Hey Martin, Keep your head and hopes up high. We are all here with you, in mind, body, spirit and soul to support you! Your a strong and skilled man that has much to give and share with the world. Sending good vibes to you from my family. Martin, you're awesome! We are sending good vibes your way!! Hugs!! Sending my best to you!! You've got this! You better be feeling puurrrrrrrrrrfect soon, so I can play with you when you visit!